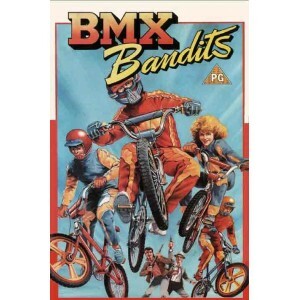 BMX Bandits is a 1983 Australian children's adventure film. This was a film debut of a then-unknown Nicole Kidman. Kidman, who was chosen ahead of 200 who auditioned for the part of "Judy", had to learn to ride a BMX bike for the role, and her stunt double was actually a man who wore a wig. After a successful Sydney bank robbery at the "Montgomery Street Bank" where they grabbed $101,586 (with the robbers wearing pig masks and brandishing shotguns), the man in charge, The Boss (Bryan Marshall), plans a further and larger payroll robbery for two days later worth at least $1.5 million, hoping that he can trust his less-than-competent gang headed by Whitey (David Argue) and Moustache (John Ley) to do the job properly, with anyone who doesn't answering to him. 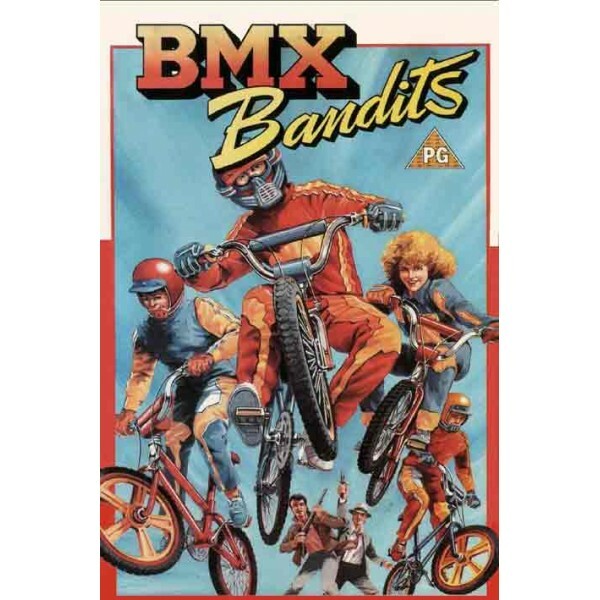 Two young BMX experts, P.J. (Angelo D'Angelo) and Goose (James Lugton), meet Judy (Nicole Kidman), who is working as a trolley collector at the Warringah Mall during the school holidays in order to be able to buy her own BMX bike, accidentally get Judy fired from her job when they crash into trolleys pushed away by the local "Creep" (Brian Sloman). The three go out in Goose's dads runabout on the harbor searching for cockels to sell in order to fix their own crashed bikes, as well as getting Judy her own, and stumble onto and steal a box of police-band walkie talkies (all the way from the US of A according to "The Boss") that the bank robbers were hoping to use to monitor on police traffic. Ironically, after stealing the box, the kids pass Whitey and Moustache who are on their way in their high powered motorboat to pick it up. The Bayside Police are able to hear the kids using the walkie talkies and the Sergeant (Bill Brady) warns them not to use restricted police wavelength and tells them to turn them in to the nearest police station (causing confusion for his not so bright constable (Peter Browne) who is on point duty at an accident site). Judy, P.J. and Goose are also unaware that the robbers know who stole the box and that they are selling them to other kids in the area. After they are spotted and chased late at night through a cemetery by Whitey and Moustache wearing monster masks (going formal according to Whitey), they manage to escape. Judy is caught the next day by Whitey and Moustache while getting a second walkie talkie for The Creep, but escapes with the help of P.J. and Goose. The trio are finally arrested but escape police custody and, with the help of the local kids, launch their own plan to foil the planned payroll robbery.